Last week an ice storm hit our little corner of the world with great force. We lost our electricity and much of our heat source, and without a safe way to leave the house, well - we were cold. I spent most of last week being mad at myself because the cold made me feel tired and cranky and kind of like a weakling. I tried to work despite the frigid environment (I had baked a cake the day before, and my camera batteries were charged), but would eventually find my way back to huddling with two pups in a wool blanket. As soon as power was restored I turned on the oven. I needed comfort food and to use some of the things in my freezer that were quickly thawing. One of those was a box of Filo dough. I have strong feelings for pie, and I have even stronger affections for Baklava (see here and here). Put the two together, and I'm a goner. Completely. This pie is absolutely bursting with nutty goodness. It's a hearty stick-to-your-ribs kind of dessert, yet it retains lightness thanks to gossamer layers of Filo. 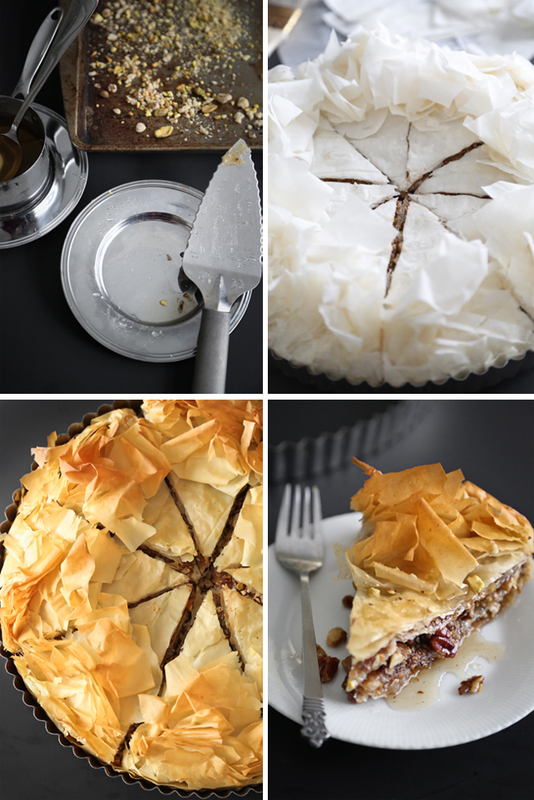 It's a short-cut to Baklava, but with a warm cinnamon note. I wasn't sure I could finish a whole piece by myself, but I did (!) and it certainly revived my wilting energies. 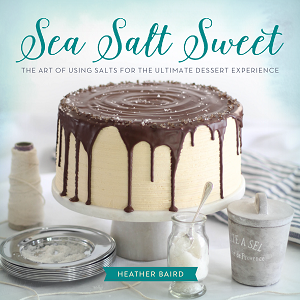 One ingredient you mustn't underestimate or leave out in this recipe is salt (fine grain sea salt, if possible). I know. I can get preachy about salt in desserts at times, but here it accentuates the pecans, pistachios and black walnuts like nothing else can. It's transformative! Before I close, I'd like to share some news that had me jumping up and down on my tippy-toes! 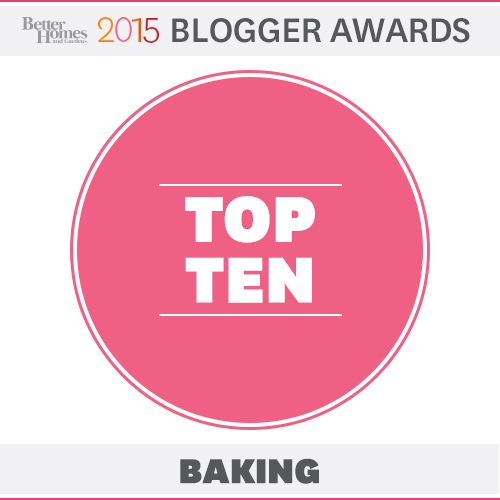 Out of thousands of entries, Better Homes and Gardens has chosen this site as one of their Top 10 Baking Blogs. (Side note: I'm pretty sure when my Mom reads this she's going to die of happiness. She's a BHG reader from way back!). 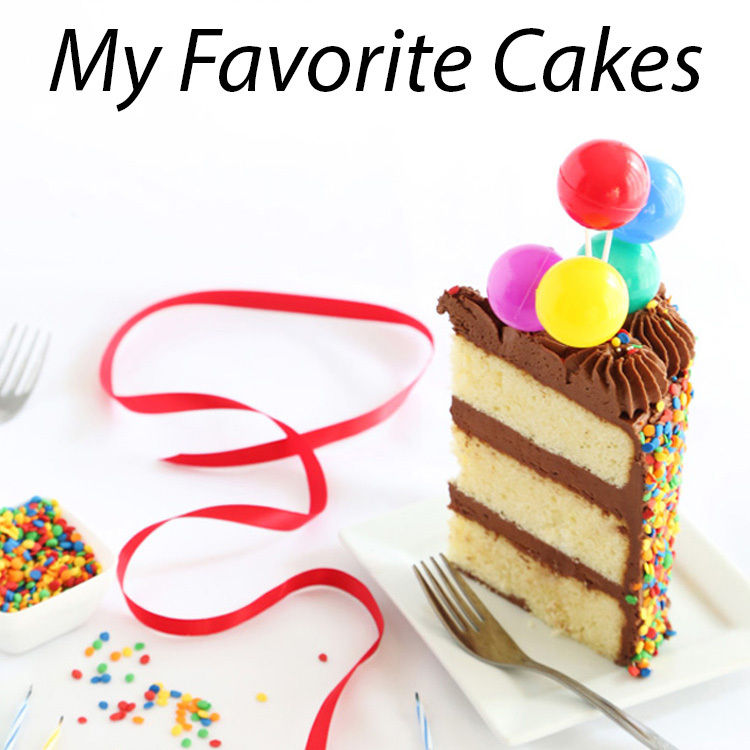 There's another round of voting for "Reader Favorite", and you can vote for your favorites by clicking the icon below. 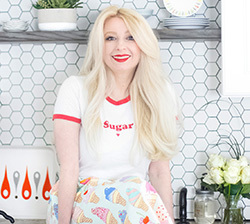 I was thrilled to find myself in the company of so many baking bloggers that I love and admire. 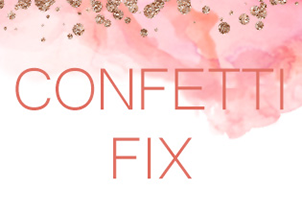 Warm and fuzzies all around (take that ice storm!). Okay, back to the delicious business of this pie. 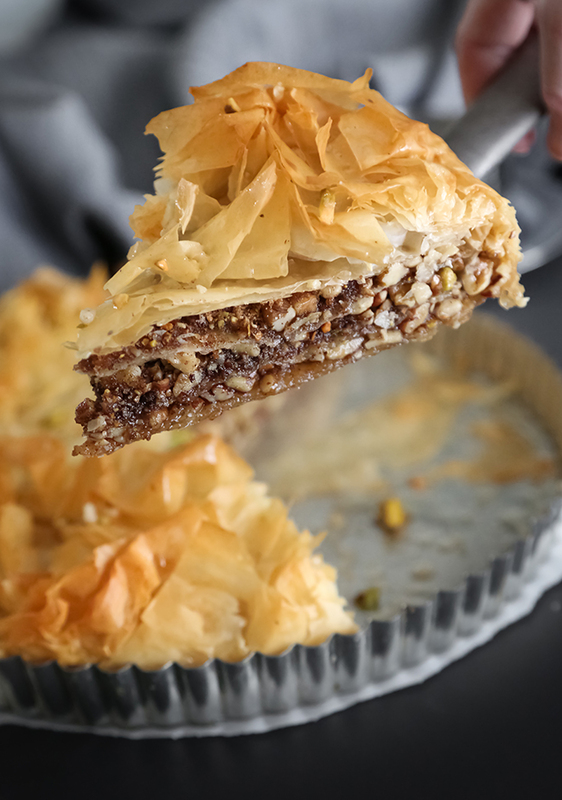 If you love Baklava, then you will love this dessert. It's one of the best pies I've ever made, and I'm planning to bring it to Easter dinner this year. It is truly worth sharing with the people you love. I hope you'll find it to be a glowing addition to your recipe box. This recipe comes from a magazine clipping tucked in one of my second hand cookbooks. I've altered it somewhat with my favorite variety of nuts and seasoned it to taste. I recommend using black walnuts if you can find them. They add depth to the overall flavor of this pie. If you can't find them, regular walnuts are always welcome to this pie party. Combine the black walnuts, pecans, pistachios, brown sugar, cinnamon and salt in a large bowl. Toss the ingredients together so that all the nuts are coated with the sugar, cinnamon and salt. Brush a 9-inch pie plate with some of the melted butter. (I used a tart pan with a non-removable bottom). Unroll the Filo dough. Drape a piece of plastic wrap over it and cover it with a damp towel to prevent it from drying out. Layer 8 sheets of Filo in the prepared pie pan, brushing each layer with butter and rotating sheets to cover the pie plate. Allow the edges to overhang the sides. Sprinkle a third of the nut mixture over the layered Filo. Layer four sheets of Filo over the nut mixture in the same manner; sprinkle with a third of the nut mixture. Repeat these last two steps. Top with an additional eight sheets of Filo, again, brushing, buttering and rotating the sheets. Fold the end of the overhanging Filo up over the top of the pie. Brush with butter. Using a sharp knife, cut the pie into eight wedges. 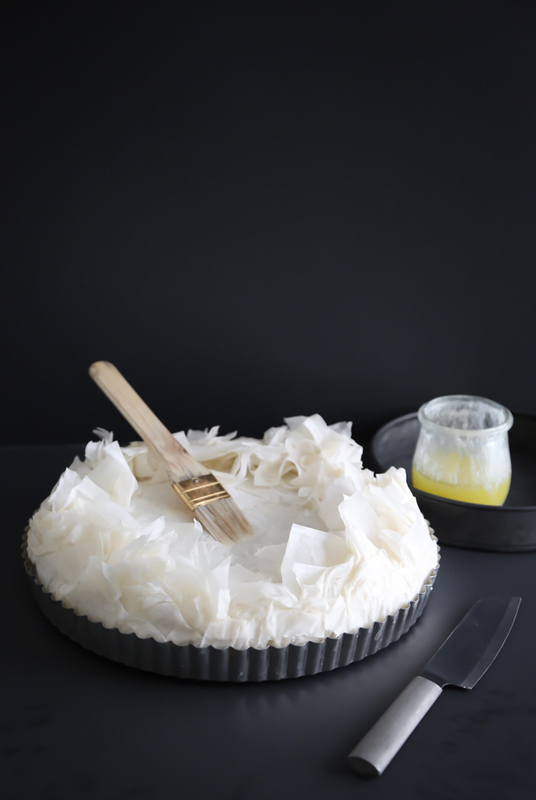 Cut 1-2 additional sheets of Filo into thin strips; arrange decoratively on top of the pie. (Save remaining Filo for another use). Bake pie for 40 to 45 minutes or until golden brown. Meanwhile in a saucepan, combine the sugar, water honey and salt. Bring to a boil; reduce heat. Simmer uncovered for 10 minutes. Remove from heat and add vanilla extract. Pour the syrup over the warm pie. Let the pie cool in the pan. Sprinkle each slice of pie with a pinch of sea salt before serving. Congratulations on the big win! Pinned the dessert, which looks incredible and now am off to vote! So gorgeous! That gif with the drizzle action is killing me. This dessert is a total showstopper! 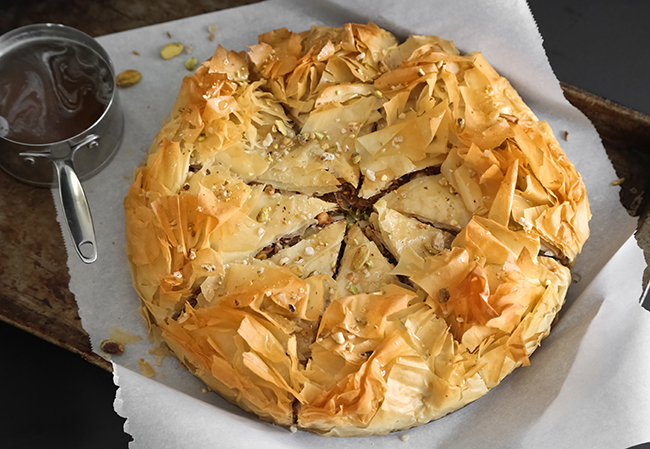 That feathery, crisp phyllo looks like a crown. Absolute congrats and 100% of my vote to you for the BHG crown as well! All this Greek-ish + celebrating makes me want to break a glass! Heather, my mouth is watering just looking at this!!! Easter, indeed! I think I'll do the same! Thanks for another fabulous post! I voted for you. I didn't even know who the f most of those others were, and was underwhelmed when I checked out their blogs. You're the best! OH ... I would like to make these in little bundles, just pick up and eat... wouldn't that be great on a holiday tray for a party. That pie is just looks amazing ! Ok !!! First off Congrats on hitting the TOP 10!!!! No big surprise ♥♥ I already skip over and voted for you in the next round so wishing all the luck there!! This looks heavenly and definitely something I will be trying VERY SOON!!! This pie is about to become my everything. Holy smokes girl!!! I love everything about this pie! It looks so delicious! Loved this recipe, love the final results and the colours! looks fantastic heather! question: would you recommend toasting the nuts before using them in the filling, or should they be raw? Raw nuts will work best in this pie since it bakes for about 45 minutes in the oven. Toasted nuts might be in danger of over-baking in this recipe. WOW! I want to make this now! As always Heather- your emails are my favorite to get! 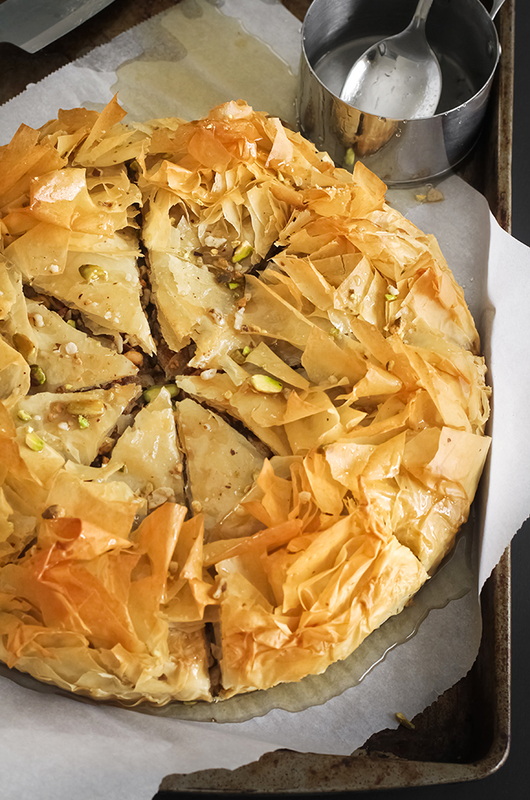 My husband LOVES baklava and I've never made it- maybe I'll try this out instead. I do have a love/hate relationship with phyllo- how did you manage to butter all the fluffy pieces on the outside?? Most of the pieces get buttered before you layer them in the pan. You don't have to be too precious with the buttering at the end. Just lightly hit the pieces sticking up with the pastry brush. (You may not have to use all the melted butter.) Best of luck with the pie! It's pretty easy to make! Now that is what I call a little slice of heaven, or better yet, pie of heaven. How amazing! Looks so good and crunchy! Gorgeous! 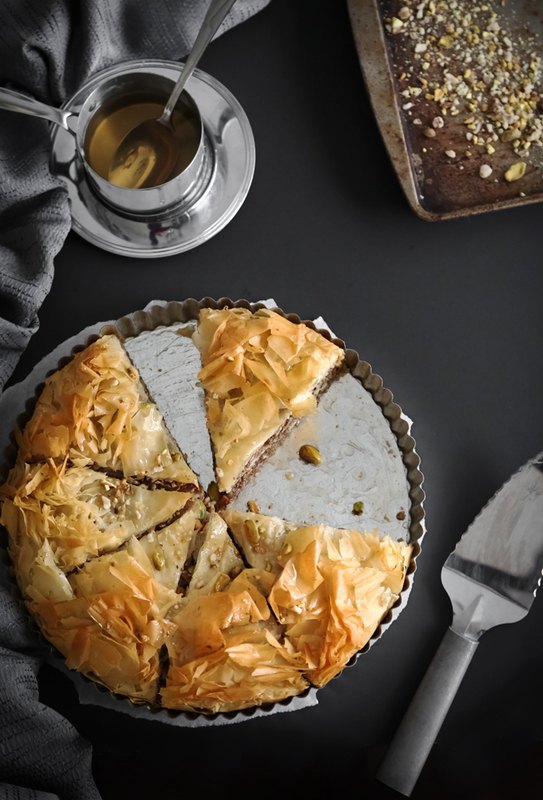 I adore baklava and a whole pie of it sounds too good to be true - in other words, I don't know how I'd ever contain myself to only one piece at a time! Pinning this masterpiece to Pinterest...many times! P.S. Congrats; heading over to vote! This is absolutely gorgeous. 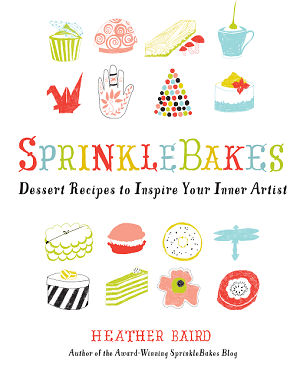 Top 10 baker - you deserve it so much Heather. Delicious and Gorgeous! You really have good recipes Heather. I want s slice of this now. Hi Heather! This is a lovely recipe and the pictures are simply drool-worthy! I've shared it on my website with credit and link back. :) Just wondering, is there an alternative to butter we can use?